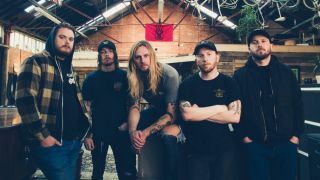 While She Sleeps have launched a PledgeMusic campaign to fund their upcoming third album. Various pre-order options are available for the as-yet-untitled record, and While She Sleep’s new track Civil Isolation is offered as an instant download with pre-orders. On why they chose to independently fund and release the follow-up to 2015’s Brainwashed, While She Sleeps say: “After 10 years of dealing with the ups and downs of the music industry, we have decided to continue our journey independently and self release our third full length album, available now for pre-order on PledgeMusic. A video announcing the album plans can be viewed below. The band previously released a video for Civil Isolation, saying: “Before we began writing the new album, we decided to create an environment where we could express ourselves and explore new ideas without feeling trapped or confined by rules, regulations or deadlines.